“The Pride of Dominica”, is generally recognized as the National Bird of Dominica. The parrot figures prominently on the Coat of Arms, the National Flag, the Public Seal, The Mace of the House of Assembly and Dominica’s Honours for Meritorious Service to the Country. The Sisserou Parrot is protected and it is probably among the oldest species of Amazon parrot in the world, and is found only in Dominica. Unfortunately this bird is most vulnerable, particularly when young, but through evolution, it has adapted to various changes in its habitat. Even more unfortunately, it has not been able to adapt to the bad influences of man. The Sisserou Parrot ( Amazonia imperialis) is a shy but very attractive native of the tropical forest of the Commonwealth of Dominica. Sisserou parrots have lived on the island for several hundred thousand years and can live to be very old (over 70 years), in captivity, some have outlived their captors. In the wild, however, their life span may be much shorter. The adult is 18 to 20 inches (450-510mm) long,8 inches (20 mm) wide and weighs 2 pounds (0.9 kg). When the wings are spread out, the distance from tip to tip is 30 inches (0.76 mm). 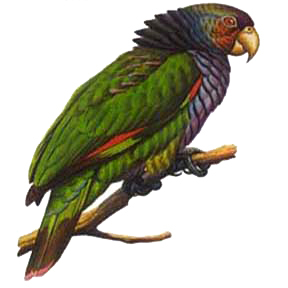 The Sisserou Parrot, the larger of the two parrots of the Commonwealth of Dominica, is a heavy bodied bird. It is well proportioned, beautifully stream-lined with colored feathers and a curved beak characteristic of all parrots. The upper parts and back are mostly green with greenish blue on the head and the eyes are red. A dark violet band, appearing black, is visible across the hind neck; the tail and under parts are of a purplish violet hue. There is a red streak on the wing tips. The Sisserou is seldom seen in populated areas. It is found mainly in rain forests, chiefly at high elevations. The Sisserou is most vulnerable when young and it faces the greatest danger while still in chick stage. It is then exposed to further danger from three species of birds ( Grive, GriGri and Malfani), snakes and the oppossum.